Thanks for the wonderful freebie. I guess it is because of my background I must believe it is in an area without rain. Flat roofs are a pain in the real world and the beautiful skylight would be a roofer's nightmare creating a bunch of swimming pools if it rained... Sorry old habits die hard. Simple rule of roofs... water runs downhill and if it leaks it is not right. I saw how you prefer the information from other posts and do not mean it as a negative just informative. That did occur to me actually, but the more triangular roof I made looked terrible, so I opted for flat. That's an interesting idea. I may try it on my next project. Can I keep that doodle for inspiration? sure and the muse called so I played with hexagon so here is a visual better than my sketch. I appreciate the visual, thanks. Wow - cool - many thanks! 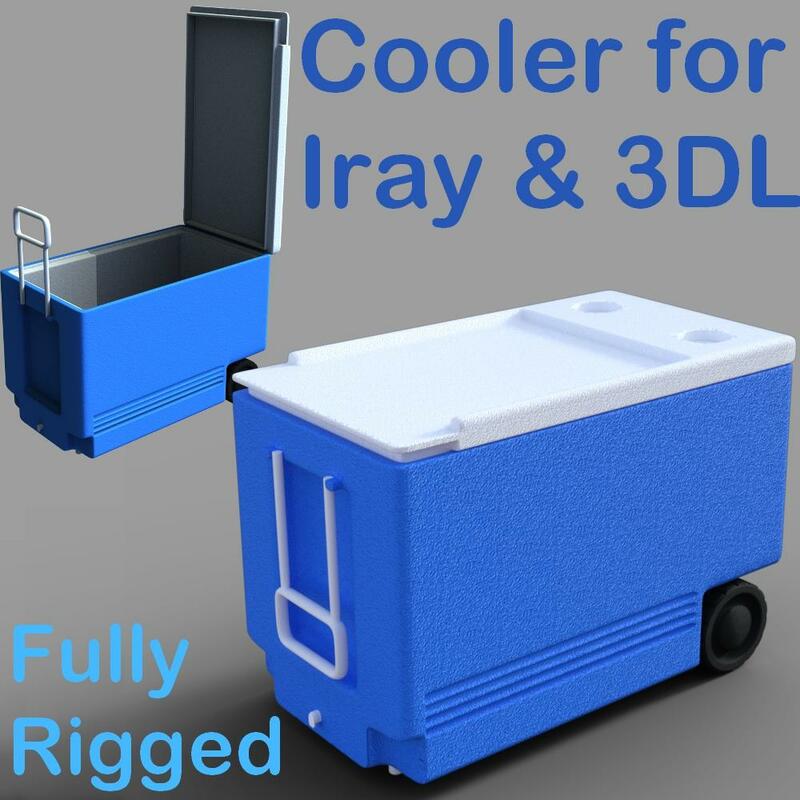 This is a simple cooler prop. It's rigged, so the wheels turn, the lid opens and the handle can be lifted. There is a drain plug cap smart-propped to the drain hole. 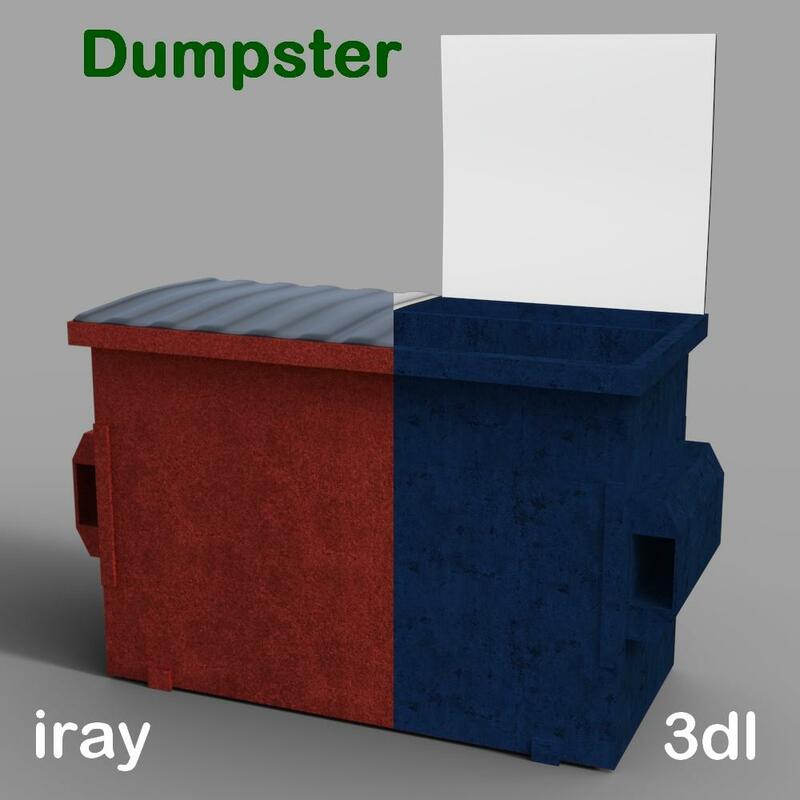 It only has the one material, but it's for BOTH Iray and 3DL. Extract to your My Library folder. Happy rendering. Not tested in Poser or on a Mac. Commercial and non commercial renders are OK, contents of the zip are not to be distributed. Already picked it up, looks great, thanks. Looks really good, thank you! You're showing your age my friend I remember those days too do you remember when Topps baseball cards came with a stick of bubble gum. Sometimes the gum would be hard as a rock I wish I held onto some of those cards though LOL! Thanks for all your wonderful work I've got many of your free items you do very good work!!! You're both quite welcome. I'm glad to give back. A simple Dumpster. The lid opens and it's for Iray and 3DL with a couple of recolors. DS4 or higher, not tested in Poser or on a Mac.